This trek route is having excellent beauty all around, with dense woods surrounding it from all side. The beauty of the woods will show you how nature preserves the holiest spots with her own lash meadows and deodars. 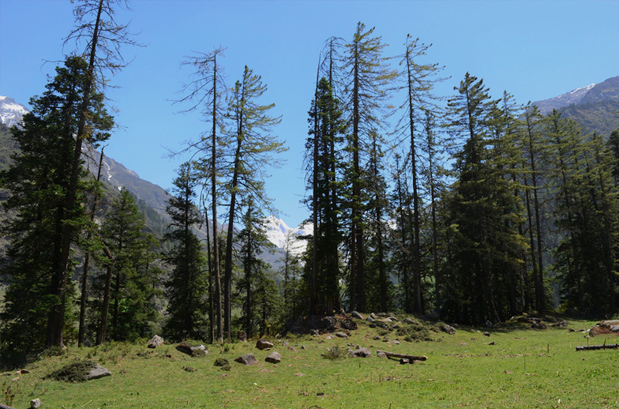 However, apart from Deodar, you will find here excellent coniferous trees and lovely looking colourful birds, seen nowhere around the world. The entire trek rout is such pleasant that it will ultimately take away all your sounds and voices. You have seen wildlife beauty of the amazons and other areas over your television, but this part of the beauty has not been caught in any of the shows. Spellbinding beauty of the place is charmed with the pew of the sweetest birds. 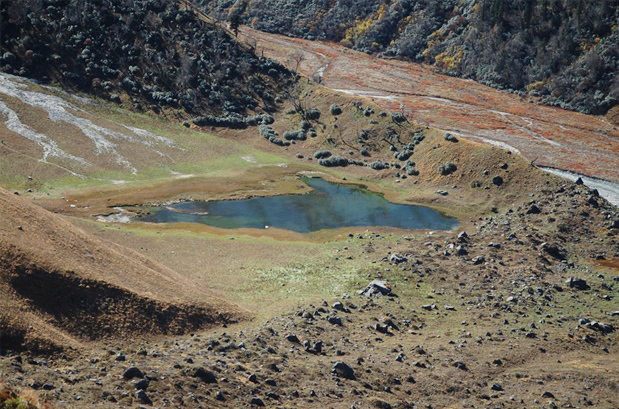 The lake, Ruinsara Tal is located at the side of the Ton Glacier, a few kilometers from Osla. The lake is having enigmatic beauty all around, with the Har-Ki-Doon valley at the closest distance of it. Swargarohini and Bandarpunch will be seeing you over the woods. So never think, in your imagination even, that you are alone in the route. Top peaks show you the path to heaven: In the route, you will find Sankri and Taluka. The route can be covered by a taxi too. The entire roadside alpines will continuously call your legs to come up. You will not able to deny the call, after reaching Seema through Debshu Thatch. From Seem to Ruinsara, you will find that Bandarpunch and Kala Nag as guide for you. Spectacular beauties will be surrounding you all the time, but still you will find the two peaks to be calling you all the time. Nature has preserved so many mysterious beauties in this trek, that you will be disappointed after the journey is completed. So many experiences really need to be digested. Just recall them – you will find a book ready for you. 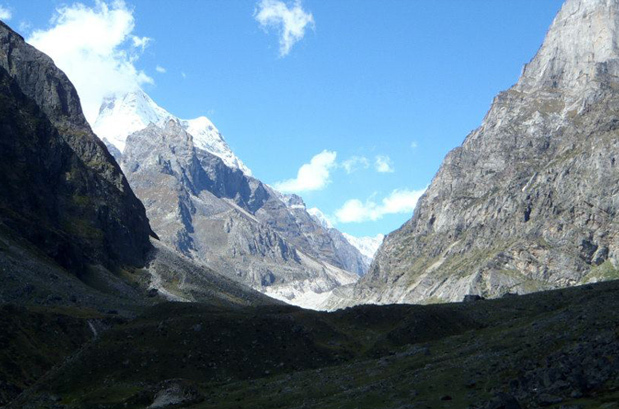 Experience Nature with her all preserved beauty: The route of the trek was initially through the village routes, but later you will face ridges and rivers. Your path will be beside this bank to the wildest beauty of countryside. Finally, you will have to take a left turn and reach the famous Har-Ki-Doon valley. It's really wonderful to watch such a crystal clear lake and a shadowy meadow. Looking at the meadows, you will feel that Mother Nature has kept her bosom wide spread, for her kids to embrace her. Ruinsara Tal is a lake at high altitude. You will find the lake placed safely between a ridge and valley wall. The beauty will remind you about the planned city. However, here the planning is made by Nature Goddess alone. Different grassy lands and alpine dense meadows will be punctuating the beauty statement of Goddess to give you a tranquilized feeling. Mahabharata Trekked the route: Myths say that this has been the route which has been followed by the Pandava Chief, Yudhisthira, with his brother and beloved Panchali for reaching the heaven. That is one reason, why this part of the land worships Pandavas and even Duryadhona, the Kaurava Head. You can easily imagine now – if this is the route to Heaven, how will the actual heaven look. Mingle with the people of remote villages like Sankri, Saud, Taluka, Osla and Seema. Witness the local and village culture. 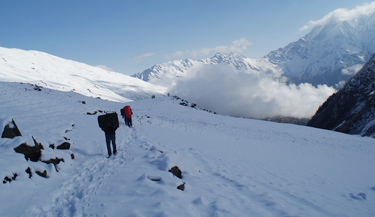 Best time to travel to Har Ki Dun- Ruinsara Tal Trek is in summers (May – June) and Post Monsoon (September – October). 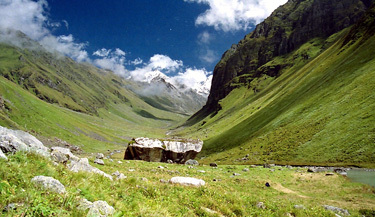 Summer: The weather of Har Ki Dun- Ruinsara Tal Trek remains salubrious and pleasing during summers. The Himalayas are distinctly visible and the cool breeze adds charm to the vacation. Carry woolens with you. Post Monsoon: Serenity and solitude are at its best during post monsoon at Har Ki Dun- Ruinsara Tal Trek. The region is blessed with snowfall during winters. You can see the best of Har Ki Dun- Ruinsara Tal Trek during post monsoon as it looks like Heaven on earth. 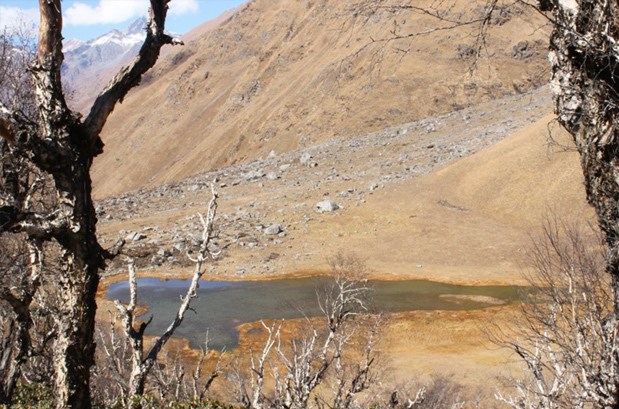 Where is the Har Ki Dun- Ruinsara Tal Trek ? Har Ki Doon Valley is a craddle shaped valley in Garhwal region of Himalaya, which connects the Baspa Valley with Borasu Pass. 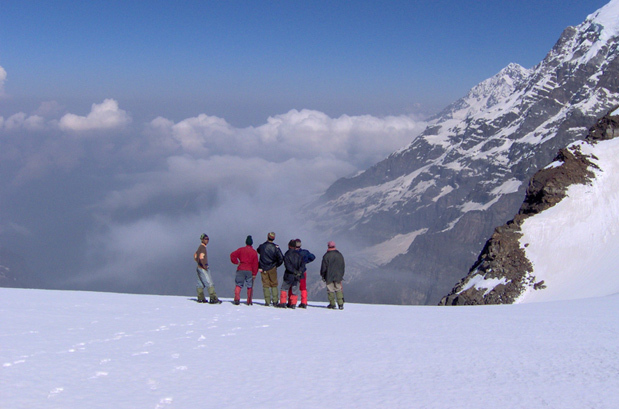 The valley is nestled at an altitude of 3500 m and can be reached during winter season, October to March. Ruinsara is a turquoise blue glacial lake at an altitude of 3380 m, amid the emerald green mountain ranges of Swaragrohini. Neat and untouched meadows surround the lake. The lake is located on the foothill of Mt. Kalanag and is about 8 km from Osla. By Air: Jolly Grant Airport (Dehradun) is the nearest airport to Sankri, which is situated at a distance of 230kms. Taxis are available from Jolly Grant Airport to Purola and Mori. By Rail: Dehradun railway station, 215 km from Sankri , is the nearest airport. By Road: Sankri is well connected with major destinations of Garhwal like Dehradun (196 km), Mussoorie (153 km), Purola (54 km) and Mori (21.4 km). Early morning, catch an AC train for Dehradun. Coming to Dehradun, transfer to Mussoorie by road and move to a hotel. Free to rest and explore the lovely hill station of Garhwal Himalaya. Night stay at the hotel. Drive to Taluka by Toyota Qualis. Taluka is a small hamlet surrounded by a beautiful landscape. On the way one can see Mussoorie, Kempty Falls, Purola and Mori. Taluka will be the starting point of our trek. Night stay at tents/TRH (Tourist Rest House). 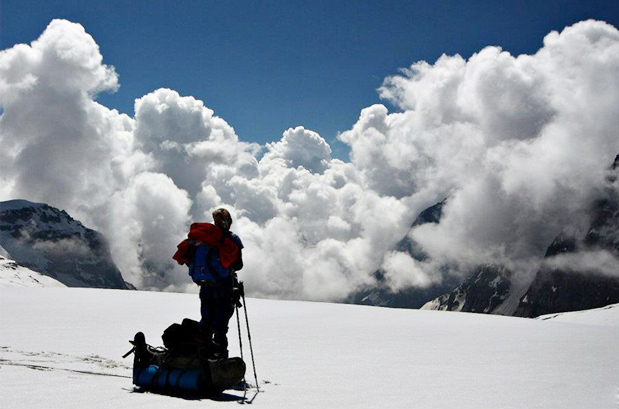 Embark on a gently trek to Osla. The trail goes through pleasing forests of willow, chestnut and walnut. Walking along the gradual ascent will bring us to Osla Village. The village is scenic and is located along a fast flowing rivulet. Camp will be set over here for night stay. After breakfast, start the trek towards Har ki Dun. Starting phase of the trek takes us through remote villages and the fields of beans and rice. Untouched by commercialism and modern lifestyle, the joyful village people still wear their traditional dresses and follow traditional lifestyles. Now we need to ascend via side of a ridge located across the river. The trail then bends towards the Har Ki Dun Valley. A dense forest welcomes us, and later gives way to a charming meadow covered with flowers and flowering herbs. Dinner and night stay in tents. The whole day we will be at Har-Ki-Dun. 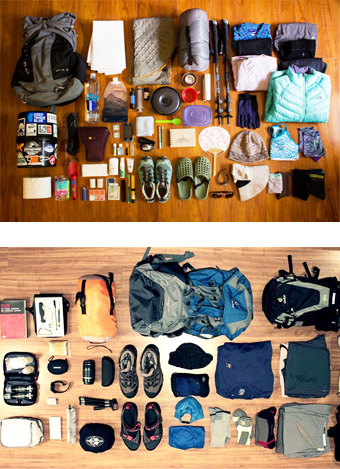 It's basically for rest, acclimatization and exploration of the beautiful landscape. Everybody is free to pursue anything – go on your personal exploration tour nearby, indulge in nature photography or just rest at the campsite. Night stay in tents. Following breakfast, start the trek toward Debshu Bugyal. It is situated, carefully concealed, between a ridge and the left wall of a valley. Will have lunch in the way. 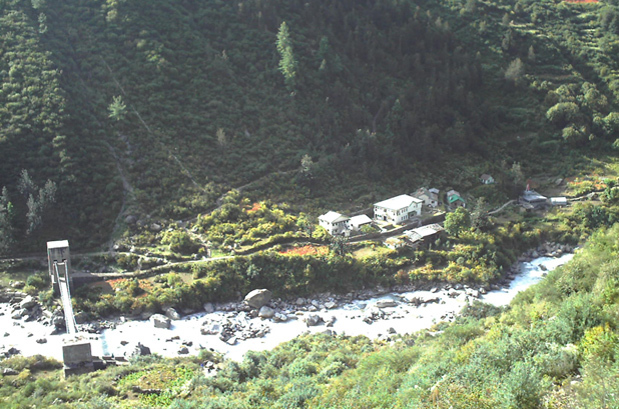 Dinner and night stay will be in tents at the Bugyal. Early morning start the trek towards Ruinsara Tal. The trek from Debshu Bugyal to Ruinsara Tal is truly picturesque. We will pass through terraced mountain fields, lush green pastures and conifer forests. The slope is moderate and we will complete the trek in 5/6 hours. Campsite by the side of the lake. Night stay in tents. It is a day for relaxation, acclimatization and discovery. Take your camera and capture the nature at its best. Or just lay by the side of the lake, completely immersed in contemplation in this mesmerizing location. Night stay in tents. Have breakfast and start trekking back to Osla, which is 18 km away. It will take around 4/5 hours. Camp will be set by the banks of Supin River. Dinner and night stay in tents. Wake up early, finish breakfast and start the trek towards Taluka (3/4 hours away). From Taluka, take a drive back to Dehradun. Check-in to a hotel for night stay at Dehradun. Take breakfast and move to railway station to board an AC train for Delhi. Arrival at Delhi by afternoon. When to book Har Ki Dun- Ruinsara Tal Trek? 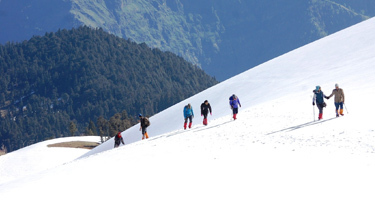 You should book Har Ki Dun- Ruinsara Tal Trek well in advance (at least 4 month prior) advance so that you get ample amount of time to prepare well for the trek. Our pick up and drop point for Har Ki Dun- Ruinsara Tal Trek is New Delhi train station at platform no. 16. We will send you the train ticket and you can board train from there to Haridwar. At Haridwar our guide will pick you from train station and then from there your tour will start. What is minimum age required for Har Ki Dun- Ruinsara Tal Trek ? Har Ki Dun- Ruinsara Tal Trek is a moderate trek with a maximum altitude of 11700ft (3566m) minimum age required is 10 years. 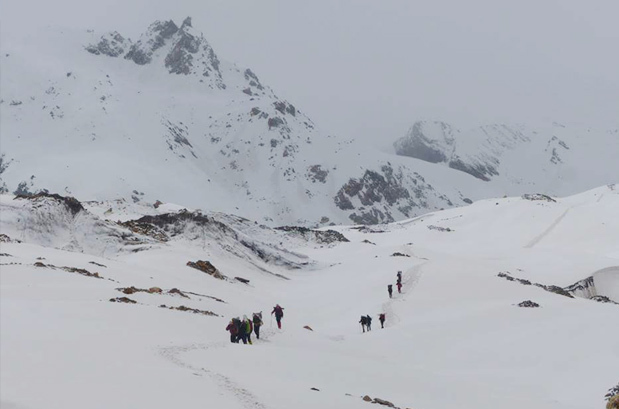 What will be the minimum temperature during Har Ki Dun- Ruinsara Tal Trek ? How long we trek during Har Ki Dun- Ruinsara Tal Trek ? We plan our treks in such a way that after 6 hours of trekking we reach next camp in between 14:00 – 15:00 hrs time and normally trek a distance of 10-15 Kms a day.